Preheat your oven to 200ºC/400ºF/gas 6, then stuff your chicken with the ½ garlic bulb, one of the lemons and the thyme. Rub the outside with lots of sea salt and freshly ground black pepper, then rub with olive oil and roast for 1½ hours. To see if it’s properly cooked, pierce a thigh with the tip of a knife and check that the juices run clear. If they don’t, continue cooking and check again. Pound the remaining garlic with a pinch of salt in a pestle and mortar. Scrape the paste into a food processor and whiz with the basil and pine nuts. Pour the mix into a bowl and stir in a few good lugs of olive oil. Add the Parmesan and season with salt, pepper and the juice of the other lemon. If the pesto looks stiff, moisten it with olive oil. 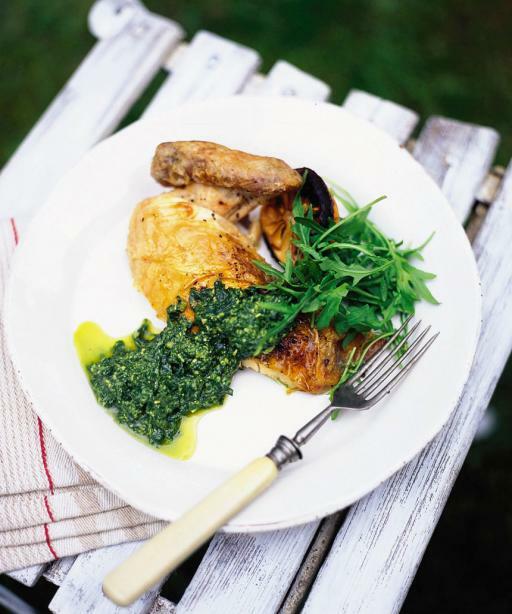 Serve the chicken in portions – hot or cold – on a big plate with the pesto in a bowl next to it. Better still, tear off bits of chicken and dip in a bowl of pesto before eating – fantastic! Great with rocket and roasted lemon halves, if you like. This entry was posted in Food and tagged chicken, meat, pesto, receipe, roast, roast chicken by Miss P. Bookmark the permalink.